They fly, float, hitchhike — and even explode. But the many clever ways seeds get around make sense: after all, a plant’s life depends on finding fertile ground in which to grow. The quest for survival has even led plants to develop delightful and devious ways of fooling us into working for them as they send their seeds out to conquer new lands. But the plants’ master plan for world conquest is no longer a secret. NATURE’s The Seedy Side of Plants rips the husk off the many remarkable ways plants make sure their offspring are spread far and wide. Apples make themselves as red and tempting as possible to encourage us to pluck them and take a bite so the seeds inside can escape to new ground. An African melon has a mouth-watering method of convincing aardvarks to go to the trouble of tunneling deep into the earth to liberate a few tough pits. There is no doubt that plants are one of the world’s most successful life forms. Indeed, Earth is a planet of plants, with millions of kinds growing in virtually every environment imaginable, from the driest deserts to the wettest jungles. Even paved parking lots often display a few tufts of tough grass poking up through the cracks. But it didn’t take a gardener’s green thumb to design this global garden. Plants did it themselves, millions of years before humans ever appeared, by evolving countless methods of producing and spreading seeds. These tiny packages of genetic material have proven an almost unstoppable means of ensuring a species’ survival. At first glance, some seeds’ designs make plants seem downright intelligent. Take apples, for instance. As The Seedy Side of Plants shows, these sweet fruits have evolved to be bright and shiny for good reason: they attract people and other animals. Drawn in by their effective advertising, we do the work of carrying apple seeds to new territory where the species can gain a toehold and expand. Indeed, we like apples so much that we’ve planted orchards especially for our favorite fruit. The practice has prompted some biologists to ask who really is the boss in this relationship: do the apple trees work for us — or do we work for them? Similar examples can be found throughout nature, from fig-eating bats that become unwitting cargo planes for fig seeds, to squirrels and woodpeckers that unknowingly help oak trees spread their acorns. The Seedy Side of Plants even includes the remarkable tale of an African melon that grows a gourd-shaped bladder of water deep underground. In the dry season, aardvarks sniff out the watery melons, digging deep to quench their thirst. In the process, however, the thirsty aardvarks also sip up a few pit-like seeds, which they later deposit inside fertilizing manure. It’s hard to say who gets the better end of the deal: the melon or the mammal. Both plant and animal, of course, get something out of these mutually beneficial relationships. Apple trees, for instance, didn’t set out to fool people into picking their fruit. But somewhere along the line, certain apple trees ended up with a combination of genes that made their fruit a bit brighter or sweeter than all the other apples. Since we liked these apples so much, we began selectively planting the trees, and learned how to breed even sweeter varieties. In exchange for the tender, nutritious fruit, the trees get steady care and even protection from potential enemies, such as insects and browsing deer. 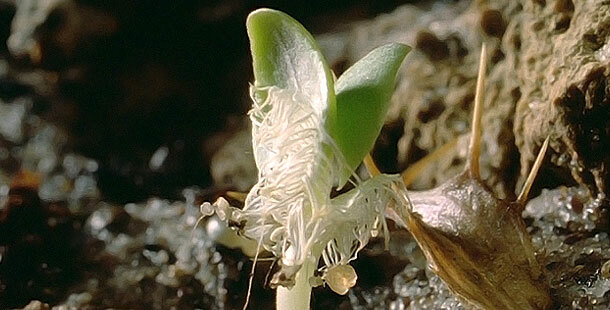 Evolutionary accidents may explain how other types of seeds developed, too. On the island of Mauritius, for instance, there once were trees that dropped their tasty fruits full of seeds to the ground. Then, a new bird arrived on the island. It loved the fruits, but the tree’s seeds couldn’t survive the trip through the bird’s stomach. As a result, the tree was in trouble, since fewer of its seeds were surviving. Then, perhaps through a random genetic mutation, one tree, the calvaria, produced fruit with tougher seeds that could survive being eaten by the birds. Given this significant advantage, the tougher calvaria soon began to thrive. Eventually, they crowded out their ancestors completely. As The Seedy Side of Plants shows, however, evolution can sometimes produce a plant that is too reliant on a particular animal for survival. That’s exactly what happened on Mauritius. There, some biologists believe that lonely 300-year-old calvaria trees await a bird that will never return: the dodo. In 1598, Dutch explorers established a colony on Mauritius. In the search for food to eat and sell, the settlers plundered the island’s natural resources, killing giant turtles, lizards, and the huge, flightless dodo birds with abandon. When the settlers did in the dodo, however, they may have also put the death of the calvaria in motion. Some biologists believe the dodos ate the tree’s fruit, and that the trip through the bird’s stomach helped prepare the seeds for germination. But now that their partner in life is gone, only a few calvaria survive. They are silent reminders of a lost past, with their seed-bearing fruit littering the ground and inviting a feast that will never come.